Two weeks ago I met my friend at London Bridge Station so that we could find and catch a train to Margate. We thought this was the most logical place to start; that trains departed London like the spokes of a wheel. After all, if I wanted to go to, say, Southend in Essex I wouldn't expect the trains to depart from Marylebone, or to Penzance from Kings Cross. We bought our tickets but couldn't see Margate on the destination board. We were advised we'd have to change at Ramsgate and to use the back four coaches. Thinking this was normal we settled down for our journey and admired the countryside, wondering when we'd get to see the coastline. But the train took us via Ashford and Canterbury to Ramsgate where we picked up another train bound for London. Eh?! It turns out that if you want to go to the northeast tip of Kent the direct trains along the north coast leave from Victoria! Live and learn. Had I seen Portillo's railway journey about the area, which was on TV last week and alas too late for this trip, I would have been better informed. Anyway, we got there. And what a lovely town. On exiting the station we were greeted by a fabulous old ghostsign advertising Dominion Motor Spirit, which I assume was some kind of oil. Crossing the road into Marine Terrace I was in heaven sitting in and photographing the Edwardian seating terrace (a similar one round the other side of the headland is in a sad state, fenced off and crumbling away). We had a wander on the gorgeous sandy beach, surely a contender for the finest sand in the UK, a paddle in the very cold sea, and then went for the obligatory seaside meal of fish and chips. Margate, having fallen out of favour with holiday-makers over the past four decades has become a treasure chest of architectural delights for people like me. 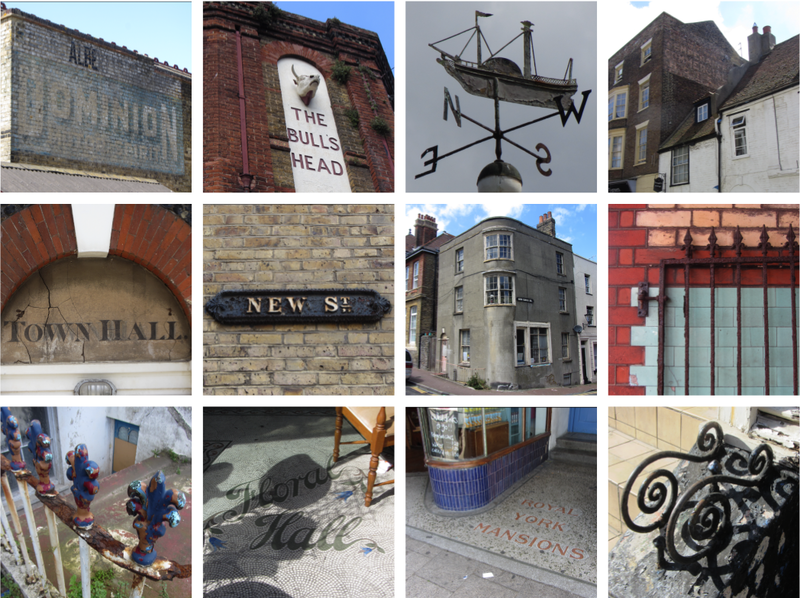 The streets, especially in the old town and along Northdown Road, are jam-packed with old shop signs, curved glass and island windows, hand-painted and hand-carved signs, mosaics and tiles, and lots more besides. 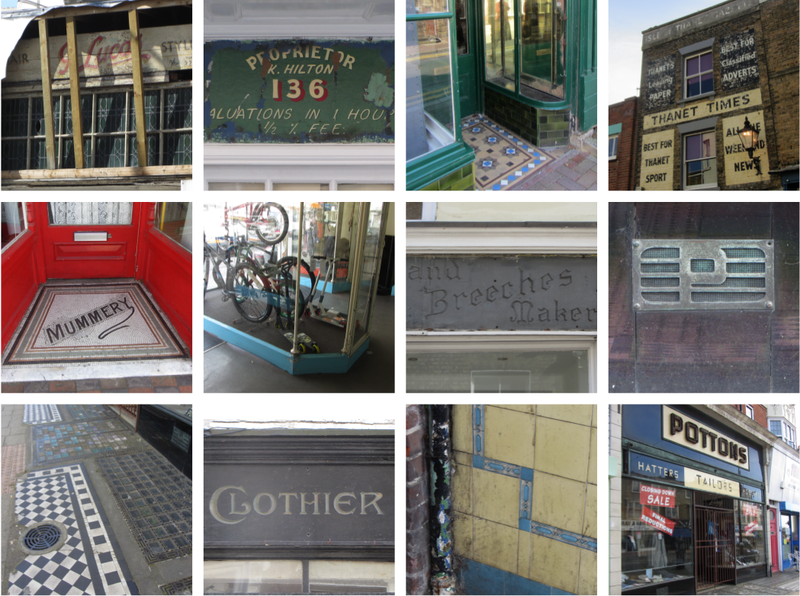 Many of these lovely shops are now owned by second-hand and antique dealers. It was hard not to go inside every one. The streets were so absorbing that we only just managed to get to the shell grotto before it closed at 5pm, and what a treat – I had no idea the place was so extensive and the work was so fine. Amazing that no one knows who created it and why. Our last few hours were spent chatting to locals supping very fine beers at The Lifeboat, the local ale and cider pub, near Market Square – highly recommended. We'd have stayed longer had the trains been more frequent and faster (there's only one 'fast' train an hour in the evenings which takes approx 130 minutes). We only just caught 8.15 (to Victoria!) and finally saw the coastline with the sky glowing pink as the sun set on our great day out. I can't believe it's taken me 30 years to return to Margate – I must go again soon, and for longer, perhaps a couple of days. I also took lots of photos of the beautiful coastline, the grotto, Thanet wind farm and other local landmarks such as the clocktower, the old Lido, the entrance to Dreamland and that hideous modern tower of flats – find some of them here.